Once per battle as a free action after you have been hit by an enemy attack, you can heal using a recovery. If the escalation die is less than 2, you only get half the usual healing from the recovery. You can’t use this ability if the attack drops you to 0 hp or below. When you cast a spell that lets you or an ally heal using a recovery, the target also adds hit points equal to double your level to the recovery. Invocation: This battle, you gain an additional use of the heal spell. The first heal spell you cast after using this invocation allows the target to heal using a free recovery instead of spending a recovery. Adv. Feat: When you cast a spell that allows an ally to heal using a recovery, you can let them use one of your recoveries instead. Once per turn when an enemy scores a critical hit against you or one of your nearby allies or drops you or one of your nearby allies to 0 hp or below, you gain an attack-reroll blessing. Immediately choose a nearby ally and give them the blessing as a free action; you can’t hold on to it. Invocation: This battle, add double your level to the miss damage of your attacks and the attacks of your nearby allies. You can wield heavy/martial weapons without an attack penalty. Invocation: This battle, you and your nearby allies deal triple damage instead of double damage on critical hits with melee attacks. Adv. Feat: Once per battle, you can deal extra damage to one target you hit with a melee attack as a free action equal to d4 x Strength Mod OR Level, whichever is higher. Adv. Feat: Target may be Nearby. Power: One nearby ally gains a +2 attack bonus until the end of the battle. Broad: Choose up to three nearby creatures (including you); each target gains a +1 attack bonus until the end of the battle. 3rd: Each target also gains 1d10 temporary hit points per point of the attack bonus. Effect: Until the end of the battle, your basic melee attacks use d12s as their base weapon damage dice. Power: One nearby ally gains a +2 bonus to AC this battle. Broad: Choose up to three nearby creatures (including you); each target gains a +1 bonus to AC this battle. Target: 1d4 nearby undead creatures, each with 55 hp or fewer. Hit: The target is dazed until end of your next turn. Hit by 4+: 1d10 x your level holy damage, and the target is dazed until end of your next turn. Hit by 8+: Holy damage equal to half the target’s maximum hit points, and the target is dazed (save ends). Hit by 12+ or Nat 20: The target is destroyed. Power: One nearby ally deals +2d8 damage with melee attacks this battle. Broad: Choose up to three nearby creatures (including you); each target deals +1d8 damage with melee attacks this battle. Hit: The target is weakened until the end of its next turn. On its next turn, if it’s unengaged, it does not attack and moves away from you. If it’s engaged, the target attempts to disengage as its first action, and moves away if it succeeds. If it fails, it moves away as its second action (drawing opportunity attacks). In either case, it will not attack unless it has no options for escape. Miss: Target will prioritize attacking you. Finely-forged and built for purpose, Dwarven armour is the envy of all other races who value martial ability. Layered plates of scale and chain blended into a impenetrable bulwark granting unparalleled mobility and protection. No Dwarf worth their silver would be caught without a sturdy heater on their arm. This oblong shield provides further protection to the already heavily armoured Dwarves, as well granting a bevy of combat utility. Forged shorter than a traditional human war-hammer, but easily twice the weight, the weapons wielded by Dwarven Clerics make a mockery of the armour worn by the races above-ground. A pendant depicting the Great Wyrm holding back the abyss - the symbol of all Dwarven Clerics. A well-wrought arbalest of timber and steel. A thickly-sown cloak of grey-elk and rabbit hide. Map of Frostbarrow, Snowhaven, and surrounding areas. I am the only Dwarven Cleric to leave the Forge - my quest for justice ensuring my exile from Dwarf lands. The Dwarf King: [Conflicted +1] Publicly the Dwarf King is unable to support my quest for justice, and was forced to call for my exile. Privately however, I have his full support to hunt down the Lich and his vile servants. The Lich: [Negative +1] The servants of the Lich have performed profane rituals to resurrect Dwarven ancestors. It fell to myself and a handful of others to put them to rest once more, the fallout resulting in a minor war between Clerics of differing opinions. As the only survivor, the punishment for desecrating an ancestor fell on my shoulders alone. The Great Wyrm: [Positive +1] The Great Wyrm is the protector of the dead and the arch-enemy of the Lich, and it is through its blessing that we Dwarves may communicate with our ancestors. I have sworn myself to the Wyrm and will unflinchingly follow its guidance. 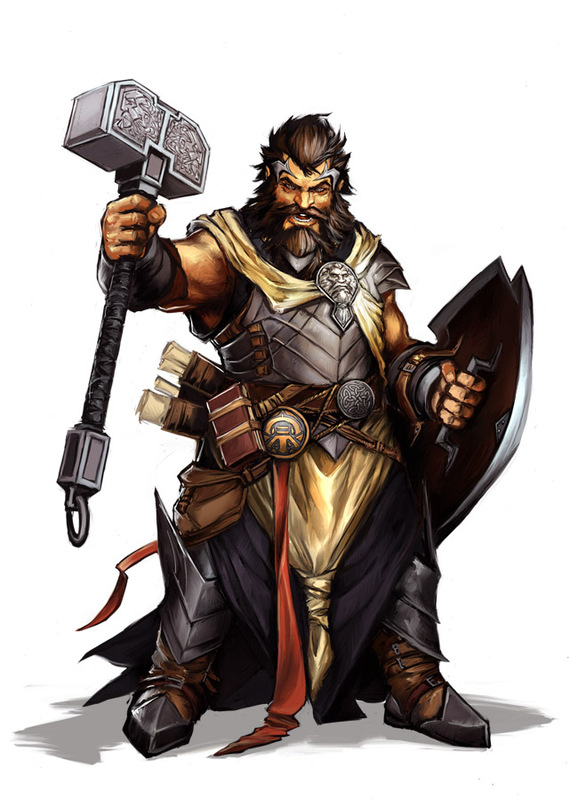 Forge-born: [2pts] Every true Dwarf is born in the thrumming halls of their mountain home, raised to venerate those which came before, and take pride in their labours and craftsmanship. If a Dwarf cannot master at least one craft by adolescence they are considered an anomaly and often ostracized. Sworn to the Wyrm: [3pts] Dwarf Clerics swear fealty not only to the Dwarf King and their ancestors, but also to the Great Wyrm - the protector of the dead and bearer of the seal to the abyss. Through its teachings they learn the ways of invocation and resistance of the undead, as well as martial feats by which to smite their enemies. Exiled: [3pts] Dwarves who suffer the dishonour of exile must rely not upon their families and clans, but instead their own wits and talents to survive in the lands above. As such exiles are master survivalists and social chameleons; able to blend into lands foreign to their own with little trouble. Those that don't do not often last long before falling afoul of the less-than-trust-worthy races.